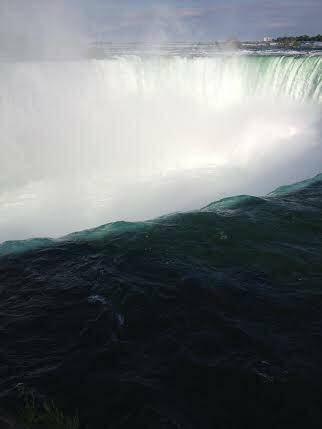 This is the Canadian Horseshoe Falls and the boat is the Maid of the Mist. It is a must when you visit and you will wear a dry cleaning bag covering as you ride to the edge of the falling falls, but you will still be drenched by the end ! If you look closely, you might see me waving from the Maid of the Mist in the mist! We stayed on the Canadian side at the Sheraton, which was overpriced, crowded. and not worth the price. The streets behind the hotel were filled with touristy , kid things of games, shops etc. We saw it as we entered the hotel and as we left, but did not venture out into what seemed a more”touristy ” place than Times Square. I love this corner and the clear green water flowing to the falls. Fortunately on the side where you view the falls, there is a wonderful garden where weddings are performed and a lovely extensive palisade walk with breathtaking views of both the American and Canadian Falls. There were lots of Indian and Chinese visitors. Professor told me that I didn’t have to welcome everyone one of the Indian visitors. . . . but couldn’t resist a few! We walked to the Visitor Center and had a good steak there, taking a vacation from grilled chicken salads! Then we had to walk back to the hotel. There are lights that are illuminated at night but we were too tired to stay to view that. There are no words I have that would add to the wonder of seeing this incredible creation except praise, wonder, and thanks to the Creator ! There were any number of rainbows when the sunlight hits the mist. This was a double one with the second just visible on the left. This was a short visit just less than 24 hours but well worth the drive and the money. 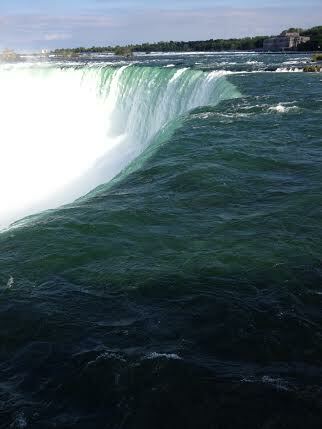 If you have a chance, do visit the great falls of Niagara! Have you been to the falls? What was your impression? There are dramatic falls in the rest of the world, have you visited one or more of them? Please tell us about your experiences. This entry was posted in Travel, Uncategorized, USA and tagged blogging, Canada, New York, Niagara Falls, photography, rainbow, travel. Bookmark the permalink. That pretty much sums it up! Thanks. . . . . Thanks so much for commenting. It was wonderful to see this ” natural wonder”. The sight and sound are amazing and impossible to really see from an image! I’d like to go there some day! SO BEAUTIFUL!!!! You took some really nice pics. 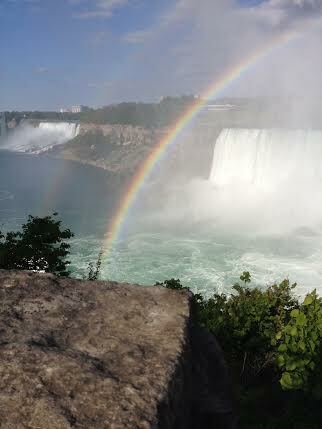 I have lived within a 7-hour drive of the Falls for my entire 50 years on this planet and have yet to see it in person. Still, this post reminds me that despite the crowds and all the overpriced tourists traps, we should get around to going one of these days. LOL , we have lived in Albany area for years and we just got there . I think it was worth the effort. I have never seen such waterfalls in all our travels. I think it deserves “Wonder of the World”! Thumbs up for the gorgeous pictures and the fall itself. I was there and was pretty much impressed as you were. I have never been east of Memphis, (except for airports on my way to Mid East or Europe). You do need to visit and concentrate on the lovely surroundings and not on a new wife! I am honored that you reblogged on your FB account ! Cheers back at you, Lance!